I've started this year off with a reading bang, which included finding a few new authors I like and discovering (and finishing) an incredible mystery/crime series. 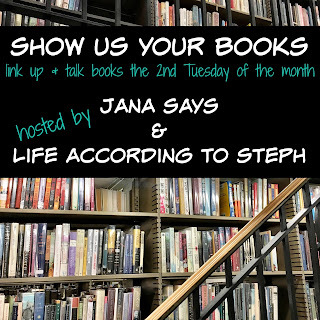 I'm linking up with Steph and Jana for this month's Show Us Your Books linkup. A few thoughts about this month's books. First, I only read 2 standalone books that weren't part of a series I was already on. Understandably, those were my least favorites. This is book #7 in the Miss Fortune series about a CIA operative who goes undercover in rural, small town Louisiana. This book didn't disappoint! We are finally getting to the meat of the story in book 7 and lots of secrets are revealed! I can't say more in case you decide to read it. I gave this one three out of five salted caramels simply because it ends without a lot of resolution...which will hopefully come in book 8. If you are a fan of the Stephanie Plum series by Janet Evanovich, you will enjoy this series. This is book 4 of the Rewinding Time series about a girl who has a computer software program that allows her to look back in time at what was happening at whatever location she's in. This time, she's researching when Charles Dickens visited America (Illinois) and it was a great 4th book. This is an inspirational series, so beware that it's slightly religious. It doesn't bother me at all and I really enjoyed this book. Four out of five salted caramels. This was book one of a series and while it "passed the time fine" as Steph says, it's not something I'd choose to read more of. I did enjoy the depth of characterization. More than a few times the book reminded me of Harry Potter, though there was no magic in this book. Three out of five salted caramels. Again, this was another first of a series books that I probably won't continue on. The premise is that a guy is robbed and beaten and had a tramautic head injury that causes him to see visions that eventually help him solve crimes. It was interesting but not enough for me to pay for the subsequent books. Two out of five salted caramels. I had no idea what I was in for when I saw this book for free on Kindle. (Kindle frequently puts the first of series for free download to hook you!) Needless to say I loved this book so much that I paid $4.99 for each additional book in the series that's been released. It starts with a girl who lives in a small town in Arkansas, works at the DMV and has "visions". The book starts right out with explaining this girl's family drama/background and she's thrust right into a crime scene unintentionally pretty quickly. This girl-turned-unintentional-crime solver tries to make a life as a single woman in a small town and throughout each book solves a crime/mystery in her town. There are overarching plot lines that go outside of one book that help tie everything together. I quickly fell in love with the characters and the main character...though she was a little frustrating at some parts. This series is an NY Times Bestseller series and it will hook you for sure! It's got crime, mystery, romance, family dynamic/drama and small-town/Southern quirkiness. This is my favorite new author and series and I can't wait until the next installment comes out in May. Five out of five salted caramels. added twenty eight and a half wishes to my list, it sounds great! also, your rating system is making my hungry lol. I want to read all the books by the first author because she has an awesome name. The books sound interesting, too. Rose Gardner sounds like a character I'd like. Totally forgot to add the Jana Deleon series to my list. I meant to try that. Twenty Eight and A Half Wishes sounds a lot like the Sookie Stackhouse series, but without all of the vampires and stuff! I'll have to check it out because it sounds so cute! I'm definitely going to check out the Miss Fortune series. I enjoyed the early Stephanie Plum books, until they became the same book, over and over. And the Rose Gardner series also sounds great. I love it when I can find a great new series to enjoy!